PrintWhat if I or my child have never played Hockey before? 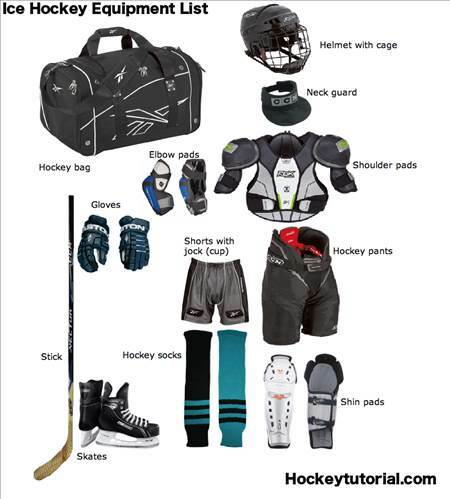 Below is an overview of the players on a hockey team as well as a list of required equipment needed to play. The goalie's primary task is simple - keep the puck out of his own net. Offensively, he might start his team down the ice with a pass, but seldom does he leave the net. These players try to stop the incoming play at their own blue line. They try to break up passes, block shots, cover opposing forwards (center and wings) and clear the puck from in front of their own goal. Offensively, they get the puck to their forwards and follow the play into the attacking zone, positioning themselves just inside their opponent's blue line at the "points." The quarterback on the ice, the center leads the attack by carrying the puck on offense. He exchanges passes with his wings to steer the play toward the opposing goal. On defence, he tries to disrupt a play before it gets on his team's side of the ice. The wingers team with the center on the attack to set up shots on goal. Defensively, they attempt to break up plays by their counterparts and upset shot attempts. Used equipment is a great way to get started while keeping costs in check, especially when they are young and growing so fast! Also, some sports stores offer starter kits that include the essentials, less the Skates, Stick and Helmet. My child wants to be a goalie...now what? Required goalie equipment is below. KMHA offers a goalie equipment rental program. You can arrange rental of goaltending equipment for the season. This way your child can get into goaltending and you can keep the costs down while they are deciding if that position is right for them or while they are growing. To learn more about this program, please contact the KMHA office. » What if I or my child have never played Hockey before?